together with some outside sources and a commentary. New chapters will be added as time permits. Colburn was a childhood computing prodigy who once defeated young William Rowan Hamilton in a mental-arithmetic contest. His most famous achievement was calculating without paper that the sixth Fermat Number (4,294,967,297) is divisible by 641 (and therefore obviously not prime). Although Colburn was no Hamilton in later life, he was a keen observer of his world, and before dying of tuberculosis at 34 recorded the events of his career (including an attempt to learn acting from one of the Kembles and a stint as a calculator for the Board of Longitude). An under-educated child-prodigy, an American in Europe, and a person with six toes on each foot, he had, to say the least, the outsider's perspective. Some Account of ZERAH COLBURN, an American Child, who possesses some very remarkable Powers of solving Questions in Arithmetic by Computation, without Writing, or any visible Contrivance. 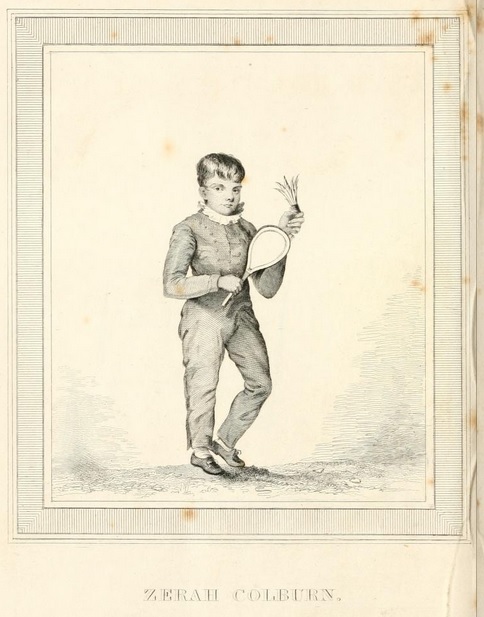 Upon certain ready Processes for Computation, supposed to have been invented by the American Boy exhibited in London, by A. H. E., with a reply by O. Vindication of the Claims of the American Boy to extraordinary Talents and original Discovery, by Mr. W. Saint.